Cactus Wraps are the perfect inexpensive solution for small or large-scale production for imprinting mugs in your home oven or a conveyor mug oven. Designed for durability and superior coverage, top to bottom prints are easily attainable as well as getting as close as possible to the handles. Simple to use with any oven, they make mug production a breeze. Works with both 11 and 15 oz mugs. Note: The Cactus Wrap is not recommended for video prints. 3. 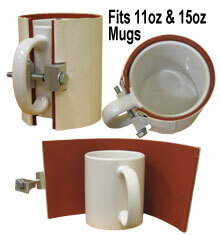 WRAP MUG: Lay mug wrap flat on the table (White side down. White side will be on the outside). Position mug in the center of wrap and bring ends of wrap together. Latch the metal clip over metal catch block (through the handle, see image above) and tighten bolt until wrap is snug against mug cylinder. Do not over-tighten! Adjust tension bolt until snug by hand, then turn another revolution or two (with a 7/16" nut driver or socket wrench, makes it easier). 5. REMOVE AND COOL: NOTE: If you are not using a Mug Oven with a Cooler then you will need to wear heat protective gloves to handle the finished wraps and mugs. Remove mug from oven with heat protective gloves. Lay mug on table holding the handle with one glove; then with a socket wrench or for faster performance use an electric drill with nut driver socket. After the wrap is removed pull the heat tape from the tabbed end and immediately remove transfer with one swift motion. Place mug in room temperature water to cool mug and stop sublimation process. CAUTION: Wrap will be hot. Use care when applying wrap to another mug. It is recommended to allow wrap to cool before using again. Only use on items the wrap is rated for; the Cactus Wrap is designed for both 11oz and 15oz mugs or any cylinder with the same diameter (ie: some steins and water bottles, etc). Use of these wraps for anything else may give poor results or shorten the life of the wrap and could result in damage such as tearing. For unusually sized or shaped items please utilize a wrap custom made for your application. If the above procedures are followed and care is taken when handling these wraps, you should expect to get many cycles from your Cactus Wraps!